If you can conceive of it, chances are we can design, engineer, and manufacture it! No matter the exacting tolerances, material composition, colors, order size, or intricacy needed, we won't just meet your needs... we will exceed them. Our team of experienced and exceptional professionals has a proven track-record of success working with companies with incredibly diverse marketplace demands. We love a challenge. And we thrive on defending our reputation as the very best thermoformed component parts design, engineering, and manufacturing firm in the business. Our ISO 9001:2008 certified quality system controls the entire packaging life cycle from design to production, ensuring against missteps and maximizing efficiencies as well as cost savings because we are committed to continual process improvement, we never rest. We are always looking to improve for the greater benefit of our customers. No doubt, we've got it down to a science. But high score achieved on our recent AIB audit further ensures that we are committed to providing safe, high quality food packaging. Whatever kind of containers you need, Panoramic's experienced designers, engineers, and tooling technicians can get them to you fast and cost-effectively. Panoramic will fill your order on time and under budget. Panoramic's design and engineering staff have years of experience working with our customers in providing low cost solutions for thermoformed plastic parts. 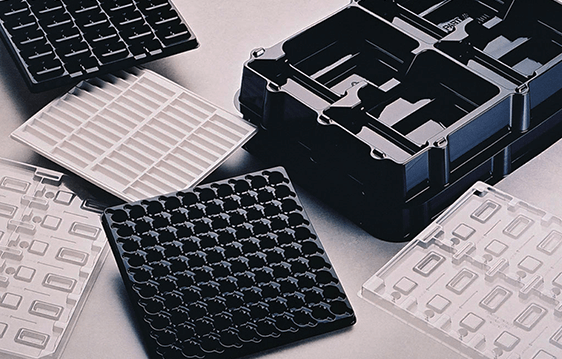 Our ability to combine our expertise with your specific design requirements makes the plastic thermoforming process the ideal option for you. Because of our vast expertise, we can advise our customers on how to optimize part and tool design. Our 3-D prototyping assures accurate conversion and a direct feed to our CAD/CAM machinery, saving programming time and lowering tooling costs. Superior product 3-D design and renderings. In-house CNC milling and tooling. Wide range of materials, colors and gauges. Lower than average industry average minimum production runs. Accurate and intricate cutting capabilities. Custom Engraved tooling for company logos. Panoramic uses only high-grade, FDA compliant PET plastic.